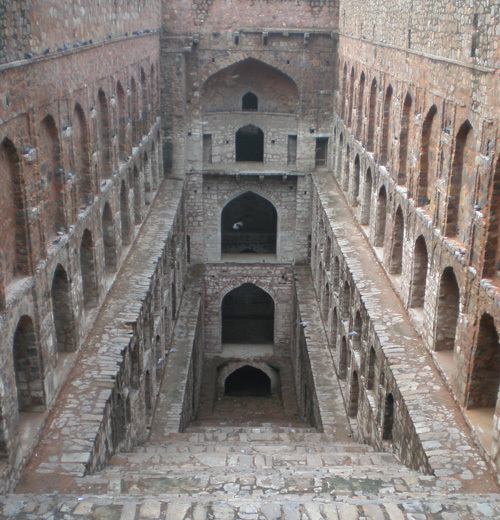 Baoli – A centuries old step-well in the heart of Delhi city. The urbanization process in India in the 20th century led to the formation of large city-centers with very high density of population. The urban sprawl also meant an immense pressure on the natural resources of these city-centers thus also affecting, among others, the quality of life of the urbanite. One of the first resource to get impacted was water – that began to both deplete and deteriorate as rapidly as was the pace of urbanization in the respective urban-centers. Delhi, the capital of India has obviously been one of the cities to have now turned into a mega-city. Delhi faces regular water crisis that only aggravates in summers and all stakeholders agree on the inadequacy of Delhi’s current water supply. But Delhi is also one of the oldest continually inhabited cities in the world. It has been the capital of many conquerors who ruled Northern part of present day India from here and has always been a populated center. Water was traditionally harvested in a number of ways to support the population that also comprised large armies; something, the planners of today can and should learn from. Though a major portion of Delhi’s water demand is met through surface water in the form of rivers and canals, which need much treatement before being supplied, a good volume of groundwater is also extracted by the Delhi Water Board to meet the ever increasing demand of 16 million Delhiites. This is where the problem arises as the groundwater resource, if only extracted and not replenished, would cease to exist. Owing to this, the groundwater in the southern parts of Delhi is no longer extractable. Now, the groundwater had been a source of potable water for all the kingdoms that once ruled the city many of whom constructed baolis or step-wells to provide and store water and as a backup during droughts. This is where heritage can come to the rescue! A baoli or step-well consists a vertical shaft from which water can be drawn and the surrounding inclined passageways and steps which provide access to the well. These were built to provide a constant supply of water to the residents of Delhi and now lie in ruins – wasted and disused. Of course, they cannot be used for direct consumption today but can prove crucial in harvesting groundwater and in recharging underground aquifers – something they were also made for. In fact, a ten year old study by INTACH (Indian National Trust for Arts and Cultural Heritage) titled ‘Blue Print for Water Augmentation in Delhi’ included an elaborate study on the benefits of reviving these baolis. While plans were made to revive some 26 of these baolis, no real ground action has taken place. The oldest existing step-well in Delhi was built in the tenth century. A millenium later, it may well be more economical to reuse it for the same purpose. Those baolis look incredible! I’ve never seen such a thing before. :: Delhi Greens :: » At Agrasen Ki Baoli: Une session interactive avec les élèves! article is very demanding by our so called conservers.what we think is new has already been done in past.we just need to maintain it.